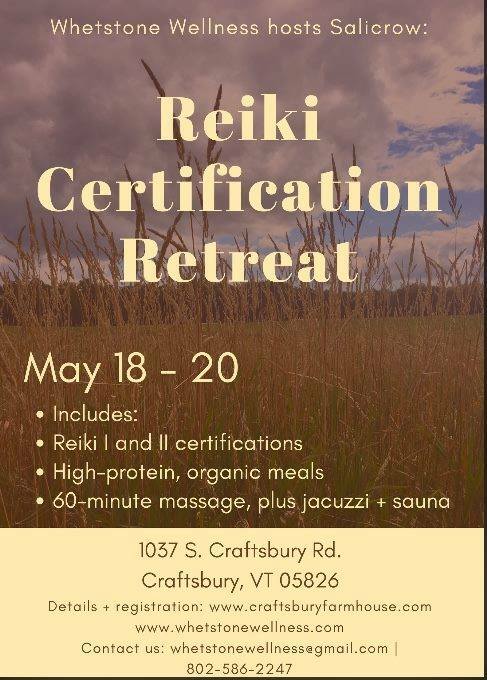 Whetstone Wellness hosts Salicrow for a Reiki I & II Certification Retreat. Spend 2 days and 2 nights at the most luxurious retreat center in the state. Leave with both Reiki I and II certifications. High protein, organic meals provided, with vegan and gluten free options available. Use of spa amenities and 60 minute massage included. Due to the intensive nature of this workshop, we plan to take excellent care of our guests. Sali Crow is a natural psychic medium, Reiki Master Teacher and Druid. She recently published her memoir, Jump Girl: The Initiation and Art of a Spirit Speaker. Sali will be spending the weekend with guests and will provide extra teachings on self care and chakras. For more details, pricing, or to sign-up visit our website. Or email us at whetstonewellness@gmail.com.